In June 2017–February 2018, a trial excavation was conducted at Horbat Neged (Khirbat Najd), north of Sederot (Permit No. A-8041; map ref. 161550–2255/604831–5662; Fig. 1), prior to construction. 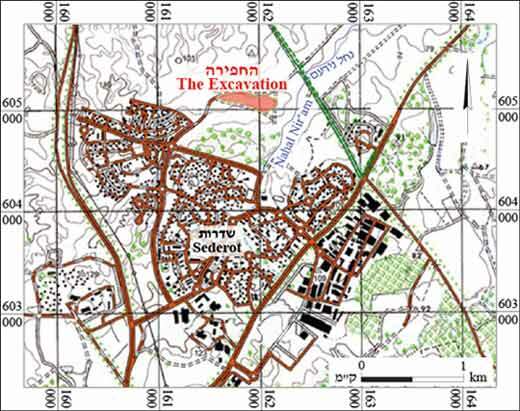 The excavation, undertaken on behalf of the Israel Antiquities Authority and financed by the Sederot Economic Company, was directed by D. Varga and F. Kobrin (preliminary inspections), with the assistance of Y. Al-ʽAmor (administration), A. Fraiberg, H. Hamer, S. Zur and D. Biton (area supervision), D. Pukshanski, A. Ben Porat, M. Hamer, A. Nevo and Y. Figelson (assistant area supervisors), A. Hevroni, O. Tamir, S. Bloch, A. Azoulay and S. Kasa (guidance), M. Kahan, Y. Shmidov and M. Kunin (surveying), E. Aladjem (drone photography), S. Gal (location map) and A. Peretz (field photography). The boundaries of Horbat Neged were defined in surveys previously performed at the site (License Nos. G-146/1988; S-521/2014), at which time a winepress, a burial structure and a church were identified. Excavations at the site unearthed Remains from the Byzantine period, including a building that was probably a storehouse (Permit No. A-7676), a winepress and two cisterns (c. 200 m south of this excavation; Permit No. A-7832). Seven excavation areas (A–G; 5.5 dunams; Fig. 2) were opened. A large rural settlement from the Byzantine period was unearthed; its eastern part was founded on remains from the Late Roman period. The excavation also revealed the remains of a large settlement from the Abbasid period, which extended over most of the site. Late Roman Period (third–fourth centuries CE). The remains of a massive building with entrances in the east and south were exposed on the eastern part of a moderate hill (Area E; Fig. 3). The walls of the structure were built of dry construction utilizing roughly hewn kurkar stones. Only part of the building was excavated because it is situated beneath a Byzantine church slated for conservation. A complex winepress was uncovered c. 50 m southeast of the building (Area F; Fig. 4). It consisted of a treading floor with a depression in its center to accommodate a screw. Fermentation cells were located to the west, north and south of the treading floor, four of which were completely preserved; they were connected by lead pipes to the treading floor. The cells were plastered, and the treading floor was paved with flagstones. East of the treading floor was a pair of round collecting vats (diam. 3.15 m, more than 1.5 m deep) paved with stone slabs arranged in a radial pattern. Smaller, round settling pits, also paved with stone slabs, were dug in the center of the vats. Two pools for breeding fish (Fig. 5), built of kurkar and coated both inside and outside with hydraulic plaster, were exposed north of the winepress. One pool (5.0 × 5.2 m) was well preserved, and its western and northern walls survived to a considerable height. In the four corners of the pool were spawning cells built of Ashkelon-type jars placed in a stepped manner. Only the southwestern corner of the second pool was preserved. An examination of the contents of the cells and the sediments that accumulated in them and on the floor of the pool will reveal the function of the pond and the species of fish that were bred in it. Byzantine Period (fifth–sixth centuries CE). The settlement reached its peak of prosperity in the Byzantine period; it extended over all of the excavated area and possibly over the entire site. Churches (Areas C and E), dwellings (Areas A–D), storage facilities (Area C) and industrial installations (Areas B, F and G) were exposed. 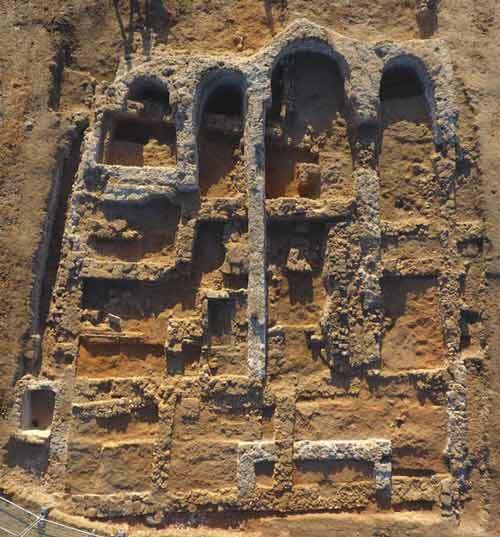 A basilica church was situated on the hilltop in Area E, but only its foundations survived (15.5 × 22.0 m without the atrium; Fig. 3). The church had a main exterior apse and two interior ones. An additional wing in the northern part of the structure probably included a baptismal font, and its eastern end terminated in an apse. No evidence of mosaics was found; the church was presumably paved with flagstones, possibly even marble ones. Several glass tesserae allude to wall mosaics. Scant remains of a structure oriented in an east–west direction — possibly a chapel — were excavated on a hilltop in Area C. The building was mostly ruinous, and all that survived were the stylobates that delineated three longitudinal halls, as well as the meager remains of an apse. 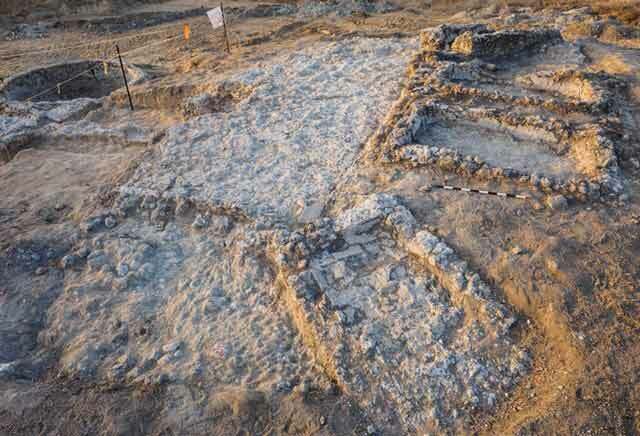 Remains of residential buildings were discovered in Area B, arranged in a planned, east–west orientation. Most of the stones from the walls were robbed, and only a few were preserved above the foundation level (Fig. 6). The foundations were constructed of local kurkar, and the walls were built partly of stone and partly of poured mud. Several sections of courtyards survived in Areas A, B and D; most were paved with fieldstones and several with roughly hewn slabs. Despite the poor state of preservation, it was possible to discern several inner courtyards in Areas A–D, and in Area A—courtyards where household activity was conducted. Rows of Gaza jars placed on the ground, upside down with their bases missing, were found in Areas C and D. The rows of jars served either as continuations of stone walls or as partition walls. A commonly accepted explanation is that these were partition walls constructed by residents using surplus jars. 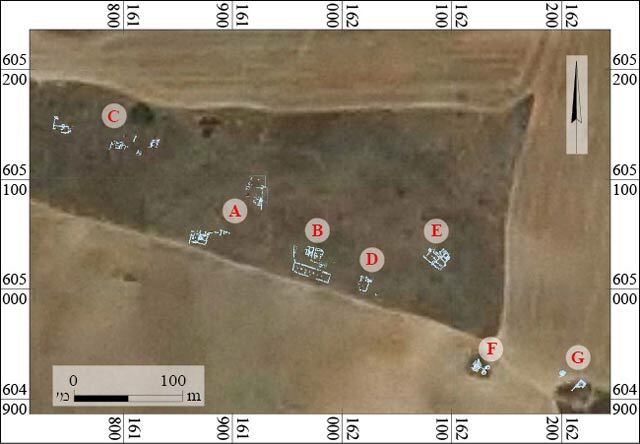 Among the buildings in Area B were two unusually massive structures, which may have guarded a nearby large building (11.5 × 41.0 m; Fig. 7), oriented east–west, identified as a warehouse. Of the latter, wall foundations were most of what survived, along with several floor flagstones. Its exterior walls were constructed of roughly hewn kurkar blocks and treated with plaster on both sides. A layer of sealant was applied to the southern wall to prevent water seepage. The building stones from the walls were dismantled for secondary use, leaving only the layer of sealant in several sections of the southern wall. A row of bases for column that supported the ceiling was exposed along the building’s axis, at 3 m intervals. Parts of the ceiling were found in the collapse within the building. 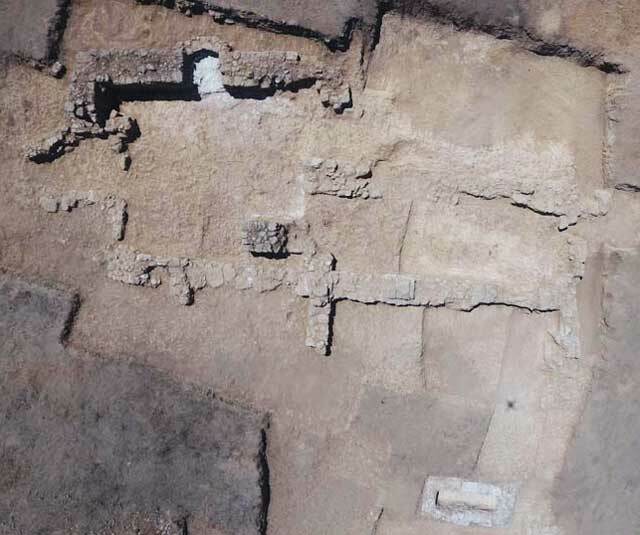 The building was identified as a warehouse based on its similarity to structures unearthed, for example, at the estate uncovered north of Ashqelon (Israel and Erickson-Gini 2013:194–196). 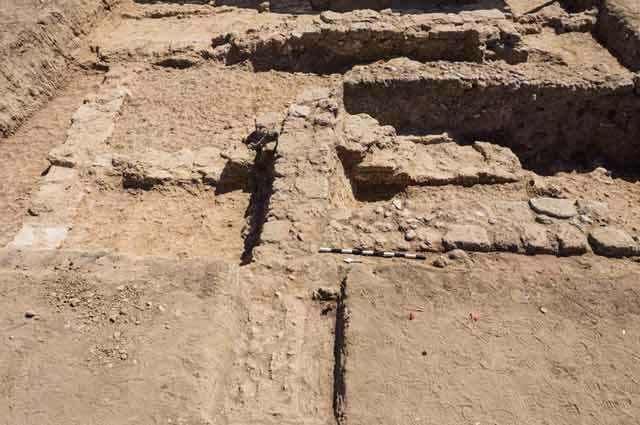 Two winepresses were unearthed at the site: south of Area B and in an industrial area in Area G. The winepress in Area B was completely destroyed, except for sections of the treading floor’s foundation. A pair of collecting vats and a settling pool survived from the winepress in Area G. The collecting vats (diam. 3 m) were circular, meticulously built and paved with stone slabs arranged in a radial pattern; settling pits lined with stone slabs were constructed in the center vats’ floors. A rectangular settling pool was built between the two collecting vats. A collapse and refuse pits belonging to a pottery workshop were unearthed immediately to the east of the winepress. The workshop probably operated after the winepress ceased to function, since pottery wasters were found inside the collecting vats. The wasters comprised mostly Gaza jars and kraters. The sherds were sampled for petrographic analysis. Abbasid Period (ninth–tenth centuries CE). The remains from this period comprise an open mosque built over the remains of the chapel in Area C and dwellings constructed in all the excavated areas. The mosque (Fig. 8) annulled the chapel: a partition wall was built widthwise across the western half of the chapel; a mihrab (prayer niche) was constructed in the southern wall; and the northern wall was dismantled and replaced by two pillars supporting an arched opening. Light gray plaster was applied to the walls and the floors of the mosque, and the mihrab was paved with flagstones. A whole lamp found in the mihrab and several pottery sherds from the building date the mosque to the ninth–tenth centuries CE. Abbasid-period structures were unearthed in all the areas where Byzantine buildings were found (Fig. 6). Abbasid-period dwellings were also built above the remains of the warehouse in Area B and above the church in Area E. These houses were preserved very poorly. The chronological gap between the two strata is evident in the thick accumulations separating the structures of the two periods. On the whole, the remains from the Abbasid period seem less substantial than those of the Byzantine period: the wall foundations are narrower and built of smaller stones, and many of the walls were apparently built of poured mud. 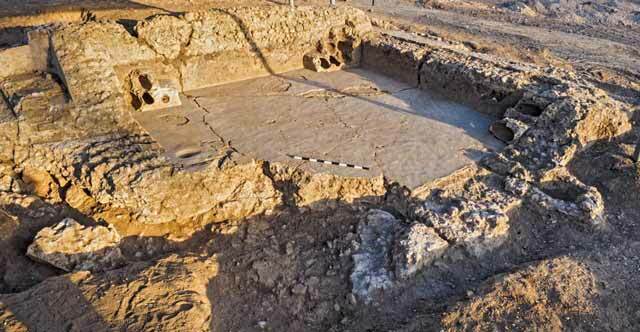 The excavation revealed that the settlement was abandoned in the eleventh century CE. Subsequently, during the Ottoman period, the buildings were dismantled down to their foundations, as the stones were taken to build other settlements in the vicinity. Further study of the finds will shed light on a variety of aspects of daily life in the settlement, such as dwellings, cult and industry. 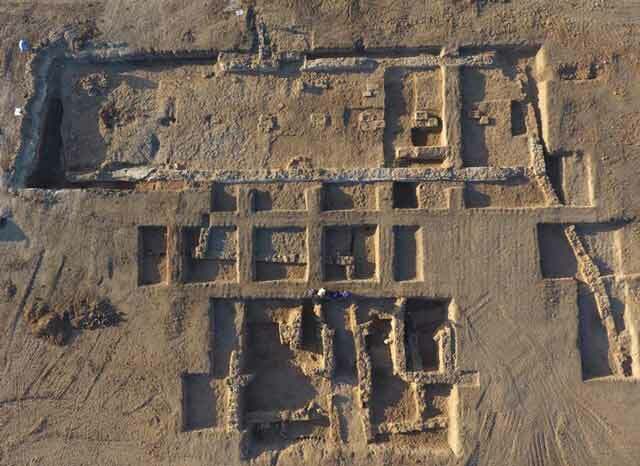 It will thus augment our knowledge regarding the function of the settlement in the western Negev hinterland of Ashqelon and Gaza, the principal cities of the region in the late classical period and in the early Middle Ages. 2. An aerial photograph of the excavation areas, looking north. 3. A church and an earlier structure below it, looking east. 4. The winepress in Area F, looking southeast. 5. A fish-breeding pool, looking northwest. 6. Building remains from the Byzantine and Abbasid periods in Area B, looking east. 7. The large warehouse in Area B, looking south. 8. The mosque in Area C, looking south.